Some of the most experienced US tobacco control experts are showing support for tobacco harm reduction and calling for a rethink of the approach to regulating low-risk nicotine products, such as vaping technologies. I see this as an emerging second front in US public health tobacco policy – one that is more pragmatic and focussed on tackling disease as effectively as possible than the established coalition. Here are the two letters from Attorney General Tom Miller and from Allan Erickson, on behalf of the National Tobacco Reform Initiative and with links and background information. Background. Iowa’s Attorney General Tom Miller, a veteran of the 1998 tobacco Master Settlement Agreement, has become active in pressing for rational, pragmatic and humane regulation of tobacco products. See his excellent speeches at FDLI 2016 conference and London E-cigarette Summit 2016. AG Miller has assembled an ad hoc expert group to consider policy options and to make the case for change. Main points. The letter sets out a number of principles that ought to govern FDA policymaking and implementation. It calls on the Agency to “take action to avoid unnecessary damage to the market for innovative and disruptive technology“, proposing a four-year delay in enforcement of the requirement for a Pre-market Tobacco Application (PMTA) while a new framework is developed for vaping products within the TCA. This framework “should be based on clear and transparent standards made through an open and consultative process“, together with a more proactive effort to “communicate useful information about risk to help consumers make informed choices“. Please read the letter for authentic text. Liberating Nicotine from Smoke to Save Lives Now: Facing and Answering 7 Core Questions to Guide Regulation, Policy, and Communications – paper addressing seven questions about the role of nicotine in society posed by FDA’s Mitch Zeller at a conference in 2016. Rethinking nicotine: implications for U.S. federal tobacco policy – more detailed proposals for reform of regulation of low risk nicotine products within the existing framework of the Tobacco Control Act, written by me. 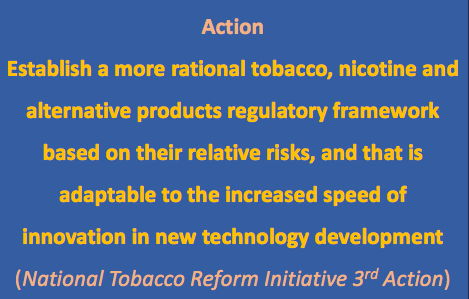 Main points: the letter draws attention to the scale of the problem and need for ambition setting out the NTRI’s agenda, drawing particular attention to the third action above on rational regulation. It suggests “decisive action is required to put the approaching authorization requirements for vapor technologies on hold, because it is threatening the demise of an entire class of potentially viable alternative nicotine products” and “to engineer a rational and proportionate regulatory framework for these products” and endorses the proposals of the Tom Miller letter above. It raises the big-picture question about whether the Federal Tobacco Control Act is fit for purpose and calls for “a review of the TCA and for it to be brought up to date“, and that debate about what form should start now. Please read the letter for authentic text. Michael Terry, Corporate CEO and Son of Former U.S. Surgeon Luther Terry, M.D. The dispute over the direction of U.S. tobacco policy is not in fact the clichéd stand-off between “public health” and “industry”. There is an argument raging within public health about the right strategy to adopt if the aim is to reduce tobacco-related disease at the greatest rate.Taken as a whole, these letters and connected papers amount to a powerful call for new thinking in United States tobacco policy from some of the most respected figures in field. I hope the leadership thinkers in groups like American Cancer Society, American Heart Association and American Lung Association will consider carefully what is written here and at least enter a period of reflection on strategy and open-minded debate. I hope these letters will be well received by Dr Gottlieb and staff at the FDA Center for Tobacco Products. They are constructive proposals formed within the legal framework that Congress has established. They are designed to help FDA achieve its stated aim to protect public health rather than unintentionally protect the cigarette trade while drowning itself and the regulated industries in paperwork. I hope that many of the academics and experts in the field, from whatever perspective, will take to opportunity to debate these ideas at conferences such as GTNF 2017 in September, FDLI Tobacco Conference in October, SRNT in February 2018, the World Conference on Tobacco or Health 2018 in March and future E-cigarette summit and Global Forum on Nicotine events.